O-Film increases touch panel revenue - Touch Display Research, Inc. I met Vico, Simon and Johann in California recently, the marketing team of O-Film, and the one-hour meeting turned to two hours. The team is very knowledgeable on the touch screen industry. O-Film is headquartered in China with sales offices worldwide. Their touch panel products include ITO-film type touch panels, metal mesh film touch panels, and One-Glass-Solution (OGS). Photo by: Jennifer Colegrove, Touch Display Research Inc., 2013. Many Taiwan touch suppliers consider O-Film a strong competitor, since O-Film has recently landed orders from not only Chinese but also Taiwanese ODM/OEMs. 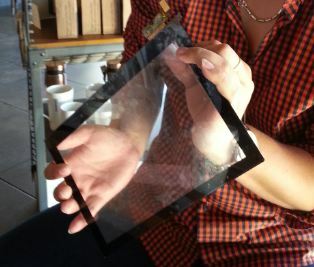 Touch Display Research believes that high conductivity transparent conductors could fit best on large size projected capacitive touch panels. We forecast the ITO-replacement market will grow to about $4 billion by 2020. More analysis about O-Film can be found in our ITO-replacement report and Touch and Emerging Display monthly report. This entry was posted in Displays and tagged China touch supplier, film touch, ITO Replacement, Large display, metal mesh, O-Film, OGS, Touch screen, touchscreen on October 2, 2013 by jennycolegrove.